This is a very colorful vegetable salad that is packed with flavor and protein. Add the dressing right before serving so the vegetables retain their color. This recipe will be a great addition to your buffet table. Snap off end of asparagus and trim ends. Peel asparagus up to the tips. Rinse well. Cut spears diagonally into one inch pieces. Set aside. Trim florets and rinse well. Set aside. Wash, seed and dice the pepper. Set aside. Pour two cups of water into skillet. Shake a little kosher salt into the water and bring to a boil. Add asparagus pieces. Cover skillet and cook 1-2 minutes. Asparagus should be bright green and firm. Turn off the heat. Remove asparagus with a spider or slotted spoon and place in glass dish filled with ice. Scatter ice cubes over and under asparagus to stop the cooking process. When asparagus are cold, remove them from ice and place them in mixing bowl. Repeat the same process with the broccoli. Return salted water to boiling and add broccoli. Florets will take 3-4 minutes to cook. Remove them from water with the spider and cover them with ice. When florets have cooled, add them to the asparagus. Add raw diced pepper and shredded cabbage to this mixture. Pour sesame oil, Tamari, vinegar and sugar into small jar. Add minced garlic and ginger. Cover jar tightly and shake vigorously. Pour 1/3 of this dressing over the diced tofu. 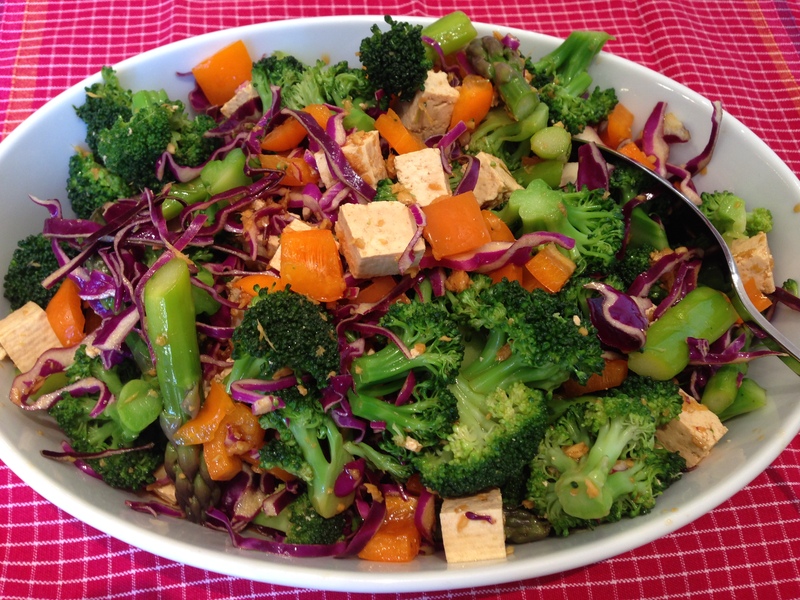 Let tofu marinate for 15 minutes before adding it to the vegetables. Toss lightly. Pour the remaining dressing over the vegetables right before serving. Serve salad at room temperature.